06-Jun-2001 -- We had quite an expedition going on for 53 lat and 5 lon! Confluence point 53N/5E is located in the Dutch Shallows which is a tidal flat area that stretches along the entire Dutch north coast. Twice every day it will be low tide and high tide with an average water level difference of some 1.5 meters, some sandbanks will fall dry during ebb, some never will and some will occasionally. The estimation was that the banks around 53N/5E would be of the latter type. Therefore quite some preparations had to be made for visiting this confluence point: the timing of ebb and flood, the reigning currents, the predicted low water level and last but not least arranging a boat. Because it was very likely that there would be little water during low tide, a typical Dutch vessel, a socalled Lemster aak, was chosen that is commonly used in these waters and that can be put 'dry' on a sandbank while it is low tide. We also used a satellite image taken during low tide to compare the local situation to a recent map. Well prepared and equipped we set sail on Tuesday evening 5 June, 18.00 hours from the Frisian village of Gaastmeer (see also the satellite map with GPS log overlayed). During the evening the IJssel lake was crossed and it had gone dark by the time that we reached the opposite side of the lake, the locks near Den Oever. Wednesday 6 June was the day. We started early and passed the tidal locks, also the barrier between fresh and salt water, at 8.30 hours and then set course to our point. There was a nice wind from the west of about 4 Bft and during the morning it was high tide. At 12.00 hours we approached the confluence point from the west and with the help of 4 GPS receivers managed to sail right over it. We spent some time in doing various nautical/sailing manoeuvres and then the waiting began for low tide and putting our barge on the sand bank. A few hours later our boat touched the sea floor exactly on confluence point 53N/5E! Of course we had plenty of time to make a lot of pictures that can be viewed through the link pictures at an expedition. It never became completely dry because all day there was quite some wind causing higher water levels than predicted. The lowest water level we experienced (at 16.00 hours) was 25 cm above the sand bank. Anyway it was well possible to wade and walk around and visit some higher parts of the bank in the neighbourhood that did fall dry. As you can see from the GPS track of our "wadden-walk" the satellite image and track coincide perfectly! At 17.00 hours preparations had to be made for lift-up and take-off because high tide was setting in. After the boat was afloat, the course was set to the isle of Texel where we arrived in the harbour of Oudeschild at 20.30 hours. Big celebrations for our succesfull attempt could begin! Thursday 7 June, the day of our return, turned out to be a real sailing day with winds of 6 to 7 Bft. From 8 o'clock in the morning till 4 o'clock in the afternoon it was rocking and rolling through steep high waves. At 17.00 hours we sailed into the home-harbour of Gaastmeer and could look back on a very good three day adventurous journey. #1: The confluence point is right under the boat. On the horizon, southwards from the boat, the (former) isle of Wieringen is visible. #2: Parked boat with crew in front. From l2r: Axel, Koos, Edwin, Geert Albert, Hein and Frits. #3: Dry sand bank in the direct neighbourhood with an inhabitant set-in. #4: Landsat7 satellite image from 13-5-2000 with our 3-day GPS log overlayed. #6: A birds'-eye view from our boat. 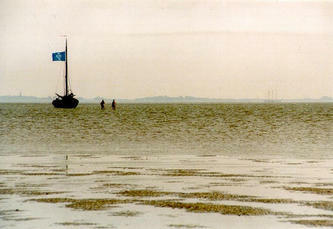 In tidal zone (mudflats) of the North Sea about 7 km from the shore.